Windows XP, Vista and 7 have built-in support for Time Synchronisation with Network Time Protocol (NTP) public time servers. Synchronizing with a NTP time server keeps your clock adjusted with high accuracy. Change the default server name (time.windows.com) by a server closer to your host or network (in this example: ntp.skynet.be). 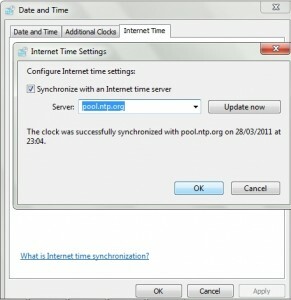 Alternatively, you can use pool.ntp.org. Corporate Network users (i.e. on a private network) may not be able to synchronise with public servers (because the ntp protocol is blocked) and should check this feature with their network administrator. Unlike XP, Windows NT and 2000 have no built-in support for Time Synchronisation. ‘Dimension 4‘ is an excellent freeware, which can be used on all windows platforms that needs accuracy. If the built-in Windows Time service (W32Time) does not function well, you can install ‘NetTime’, a simple time synchronization client. NetTime is a freeware Simple Network Time Protocol (SNTP) client for Windows and runs fine on XP. Posted by bioss at 2:58 pm on July 1st, 2009. Categories: support. Tags: internet, windows.